The Google Maps mobile app announced at its annual I/O developer conference in May 2018 is now live for a small number of users, according to one media outlet. The app, called the AR Visual Positioning System, provides navigation through a layer of augmented reality on a real-time map seen through the user’s camera. Rachel Inman, the user-experience lead for the augmented reality project at Google, told the Wall Street Journal (WSJ) the feature isn’t meant to become a traveler’s primary navigation tool. And that it’s most useful at complicated intersections or finding hidden alley ways. Without a real estimated time of completion, the WSJreports that the feature will roll out "soon" to a few Local Guides, and it will only become more available when Google developers think it is ready. Evidently, the app also prevents a person from using the camera too much, so that it doesn’t drain the battery. If the user lowers the phone, the app will flip to the standard map. And if a user holds the phone in front of their face for too long, it will slowly darken the screen. Maps are only the beginning, however. AR can help people search and learn more about their surroundings. Years ago, Microsoft and Google tried to create camera technology that allows people to navigate through stores and restaurants. 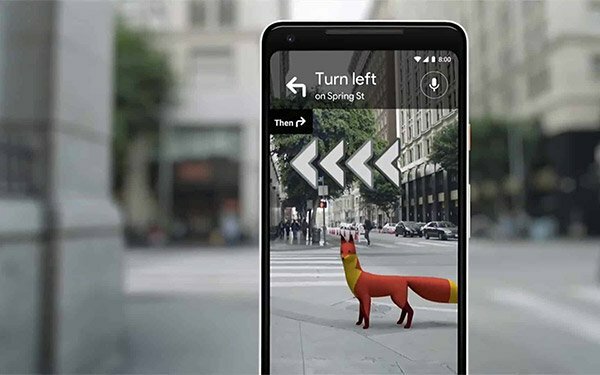 Today, technologists at Google believe that AR maps combined with Translate tools can even translate every sign someone passes into the language in which they are most familiar.